Recorded in several forms including Shutt, Shute, Shutte, and the apparently later diminutives: Shutle, Shuttell and Shuttle, this unusual surname is of pre 8th century origins. It can be either job descriptive for an archer or hunter, one who shot, or it can be locational. If the former the derivation is from the Olde English 'scytta' or the Germanic 'schute', meaning 'to shoot'. These terms were largely outdated by the later 11th century French 'archier', the modern archer. 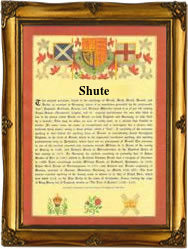 When locational the origination is usually from a place called Shute in Devonshire. This village was recorded as "Schieta", in the year 1200, and as "Schete" in the tax rolls known as the "Feet of Fines" in the year 1228. It is derived from the Olde English pre 7th Century "sciete", meaning a projection of land. There are also minor places derived from the same element in Wiltshire and Berkshire, called Shute and Shoot, respectively, whomay also have produced surnames. During the Middle Ages, when migration for the purpose of job-seeking was becoming more common, people often took their former village name as a means of identification, resulting in a wide dispersal of the name. Early examples of the surname recordings include Simon atte Scheot in the Exchequer Lay Subsidy Rolls of 1328, whilst Robert Shute who died in 1590, became the second baron of the Exchequer in 1579; and Samuel Shute (1662 - 1742) was the Governor of Massachusetts, from 1716 - 1727. Other examples include: William Shutle at the church in the city of London known as Holy Trinity in the Minories, on November 9th 1674, and a century later Margaret Shuttle at the church of St Dunstans in the East, Stepney, on May 10th 1774. The first recorded spelling of the family name is shown to be that of Robert atte Shoete, which was dated 1328, in "Kirby's Quest" for the count of Somerset". Throughout the centuries, surnames in every country have continued to "develop", often leading to astonishing variants of the original spelling.